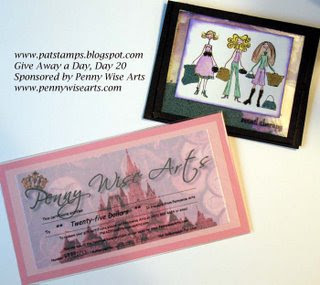 To help continue the TJNL Celebration, today's giveaway is brought to you by Penny Wise Arts. The lucky recipient of this giveaway will receive a $25.00 gift certificate from Penny Wise Arts. To enter the giveaway for today, simply leave a comment on Pat's blog entry telling her that you would like to enter. Enter by 11:59pm EST on Sunday, October 21, to be eligible to win.